Big-O Notation Big-O Notation | Hello Blog! Big-O notation is used to estimate time or space complexities of algorithms according to their input size. 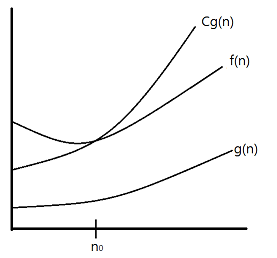 Big-O notation usually only provides an upper bound on the growth rate of the function, so people can expect the guaranteed performance in the worst case. Due to the reason, Big-O is more widely used by developers compared to Big-Theta and Big-Omega. In real situations, we may face more complicated expressions than the examples above. Let’s suppose that the complexity function is , and we need to simplify this expression using Big-O notation. To say the conclusion first, among the three terms , , and , the one with the highest growth rate will be used as follows: . , where and are real numbers. Going back to , we can use the same approach in order to make Big-O notation for . Many algorithms consist of two or more sub-procedures. We can derive their proper Big-O notations using the sub-procedure’s Big-O. By the definition of Big-O, there exists such that for all and for all . Also, let , , and .